The next Local 802 membership meeting is on June 6 at 5 PM in the Local 802 Clubroom. 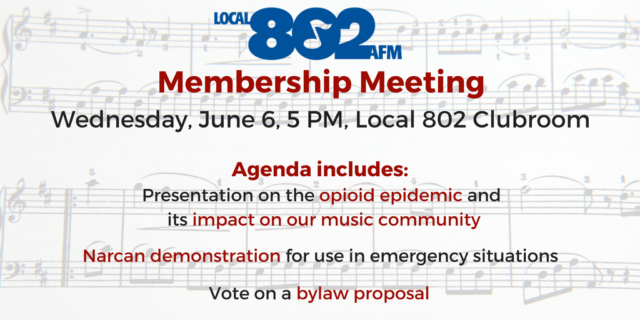 As the entire country grapples with fighting the opioid epidemic, Local 802 musicians are coming together to learn about its impact on our music community and to arm ourselves with the knowledge of how to use the life-saving drug Narcan in emergency situations. Other agenda items will include regular updates on union business and a vote on the below bylaw proposal. NEW LANGUAGE IS UNDERLINED: Article III, section 5: (a)…A further portion of the amount thus collected by the Union equivalent to one-quarter of one percent (0.25%) of all scale earnings on which work dues are collected by Local 802 shall be dedicated for use in Public Relations programs. Such programs may include the Emerging Artists Project (EAP) and any other similar program meant to increase the union’s membership and bargaining unit work available to the union’s membership. The amount of any grants awarded as part of such program shall not exceed the actual amount of funding established by the Executive Board available for such program at that time. The Union will notify its members of the status of such program on an annual basis. The Executive Board has reported this amendment favorably.